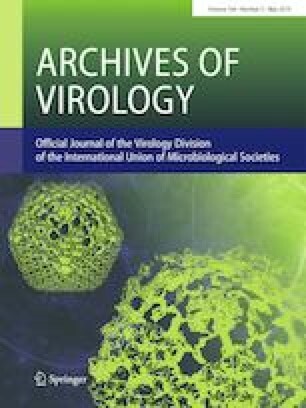 Two begomoviruses were isolated in the northern Brazilian state of Pará, infecting non-cultivated Hibiscus sp. and cultivated tomato (Solanum lycopersicum). The complete genomes (DNA-A and DNA-B) of the two viruses showed the typical organization of New World bipartite begomoviruses. Based on the species assignment criteria in the genus Begomovirus, each virus is a member of a new species. The virus from Hibiscus is most closely related to sida yellow mosaic Yucatan virus, while the tomato virus is most closely related to abutilon mosaic Brazil virus and corchorus mottle virus. Recombination events were detected in the DNA-A of the tomato virus, but not in the Hibiscus virus genome. We propose the names “hibiscus golden mosaic virus” (HGMV) and “tomato chlorotic leaf curl virus” (ToCLCV) for the viruses reported in this study. The sequences described in this work have been deposited in GenBank, with accession numbers MK558058–MK558062. The online version of this article ( https://doi.org/10.1007/s00705-019-04245-6) contains supplementary material, which is available to authorized users. This work was funded by Norte Energia S.A., CAPES (Finance Code 001), CNPq (Grant 409599/2016-6 to FMZ) and FAPEMIG (Grant APQ-03444-16 to FMZ).